After iPhone 6 came into the market last year, Apple had to reply to reports about its new phone which was bending by mistake. However, the fuss died down soon since technology which enables phones and tablets to bend by design have been making way in the market. Chicago start-up Polyera had spent 10 years in making screens which just do not curve but it is developing displays which can twist, bend and also roll up like a yoga mat. The biggest challenge is not getting the surface screen to bend but the hardest part is getting the layers of electronics behind the screen like the transistors, to distort. Founder and CEO of Polyera, Phil Inagaki states `the majority of electronic devices that we tend to surround ourselves with are what is called rigid bricks and if allowed to be softer and more flexible, it would enable all sorts of new experiences as well as devices to be created. Manufacturers of wearable devices are the first that Polyera believes would be embracing truly bendable technology and to prove its concept, Polyera is creating its own `Wove Band’, a long rectangular display which one can curve around the wrist something like a snap bracelet. The said prototype Wove Band tends to feel much like a wearable. It utilises a very low amount of energy so much so that when one is not interacting with the screen, it can display artsy pattern or designs. The band uses white and black e-link from Taiwan as against a much colourful display which tends to consume more power. When the user taps on the Wove Band with their fingers, you can change the screen to display weather forecasts, headlines or email. The company envisages its own method of apps and services just like the iOS or Android, in order to provide content for the model which is scheduled to be released in 2016. Even though the Wove Band is not taken off, the technology seems to be favourable. 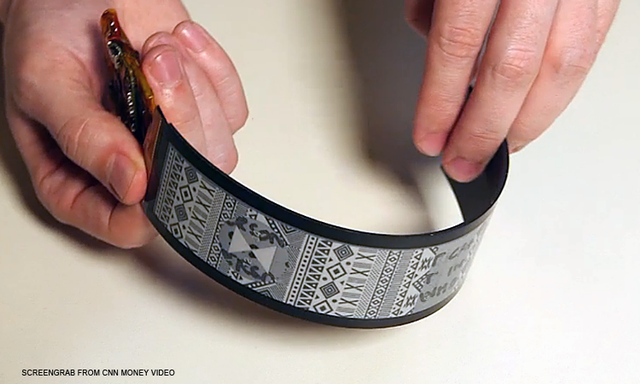 According to analysis from Markets and Markets, the flexible display market is said to be worth almost $4 billion by 2020. Polyera is one of the startups, besides universities and also the U.S. military who are investing billions of dollars in the study and development of the flexible screens. Some of the companies that have already taken steps by manufacturing phones with screens that tend to wrap around the device from the front to the sides, are Samsung. LG too has its bendable `Flex’ phones that are almost curved to the shape of the head. Apple has received a patent for a `flexible electronic device’ early this year and the filing showed two dozen drawings about how a device could be warped. Whatever progress a company like Polyera tends to make, Apple as well as Samsung would undoubtedly be keeping a close watch on the development and what was earlier only an accident – #BendGate – would probably someday be a key product feature.